Have you ever wanted to get up close and personal to some of the seas most amazing creatures? Well now you can with the help of Whitby Whale Watching. So few people realise the North Sea, and more importantly, just off Whitby, boasts such a rich variety of sea life below the surface. Every year during late summer and autumn vast shoals of herring migrate to the inshore waters off the Yorkshire coast to spawn. The herring, in turn, attracts cetaceans, sharks, birds and seals to feed. 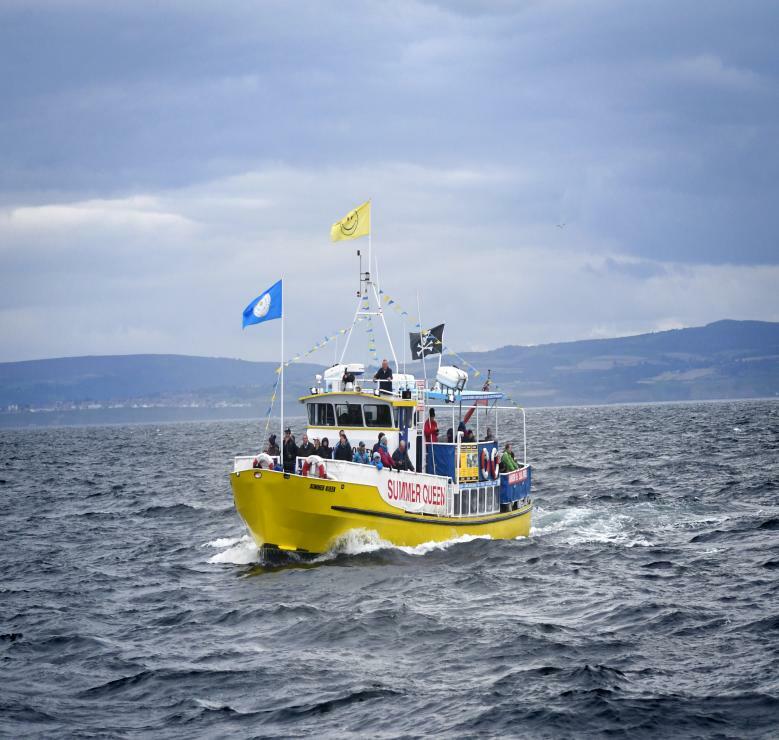 Over the past few years the whale watching trips on board the Specksioneer, Summer Queen and Esk Belle III have spotted Minke, Fin, Sei and Humpback Whales, white-beaked and bottlenose dolphins, porpoise as well as thousands of seals. You don´t need to travel the world to experience this amazing sight you can do it all from Yorkshire´s premier resort, Whitby. Of course we also see other creatures – sunfish, jelly fish, sharks – and many seabirds – Gannets, Guillemots, Razorbills, Puffins, Fulmar, Kittiwake, Herring Gull, Cormorant, Skuas, and Terns to name just a few. Late autumn brings many migratory birds such as Shearwaters, Raptors, different species of geese, ducks, wading birds and many small birds like wablers, robins, finches and chiff chaff on their way to land. See TRIPS PAGE for probability of sightings. We provide data from our sightings to SEAWATCH FOUNDATION, for whom we are a recommended operator. Whitby has a long history steeped in whaling and the herring fishery : thankfully we only shoot whales with cameras now! The herring have always been here, along with other fish species , although stocks have gone up and down over the years. The whales have always followed the herring on their migration around the North Sea. We just haven't really noticed -until now!! In 1753, as James Cook's career was just taking off, several Whitby Merchants came together, initially with just two ships, to form the Whitby Whaling Company and set out from Whitby harbour to Greenland. The early whalers consisted of both local fishermen and a number of more experienced Dutch specialists. Between 1753 and 1833 there were 55 whaling ships operating from the harbour and by 1768 a Whitby ship, Jenny, was noted as one of the most successful whaling ships in the whole of the British fleet. The most successful year was 1814 when 172 whales were caught giving a total of 1400 tons of oil which was used for street lighting in Whitby. Jaw bones would be attached to the ships mast to signify a successful catch, hence the commemorative whale bone arch on the west Cliff today. The bone arch was replaced in 2002 as years of facing the harsh weather conditions had left the monument in a state of decay. The current whale bones were donated by Whitby's sister town of Anchorage, Alaska, They were found abandoned after a legal hunt by the Inuit on Alaska's northern coast. It is thought that Whitby's whaling industry was responsible for the harvest of over 25,000 seals, 55 polar bears and 2761 whales. These were brought back to Whitby where great boiler houses built alongside the harbour rendered the blubber into oil. A career in whaling offered local men money and excitement hand in hand with danger. Many men were lost to hazardous seas and the extreme weather conditions of the North. Reports tell of many boats being upturned by the seas, crushed by ice and of men lost. Whitby's whaling industry came to an end in 1837 after a succession of less successul trips. The last whaling ship to enter Whitby was empty. 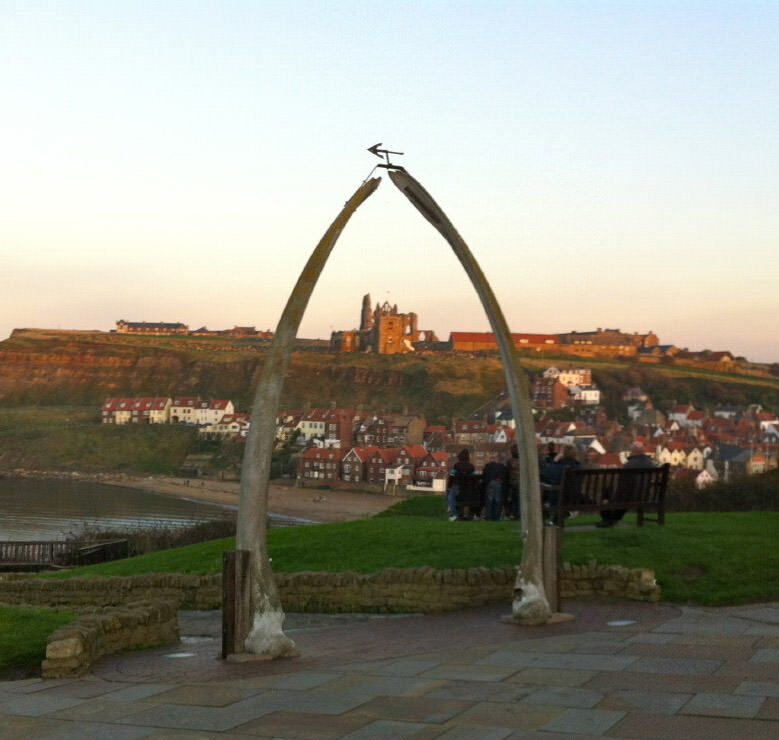 One family name synonymous with Whitby whaling is that of Scoresby. Both Scoresby's held the position of "Specksioneer". This title of Dutch origin meant the officer in cahrge of fishing apparatus and chief harpooner. William Scoresby Senior (1760 - 1829) grew up on a small farm near Pickering and was an agricultural labourer before going to sea. He joined the crew of the whaling ship Henrietta in 1785, rising through the ranks to become captain in 1791. In 1806 he broke the British record for sailing furthest north, reaching latitude 80* 30' with his son William Junior as chief mate. In 1807 he developed the crow's nest to provide shelter for the navigator at the top of the main mast and is believed to have been inspired by the pulpit in St Mary's church at the top of the 199 steps. Until recently a monument to his invention stood in Whitby. During his whaling career he caught a total of 533 whales on 30 voyages, the greatest number anywhere in Europe and once even brought back a polar bear. That is why there is a large polar bear on top of the shop on the east side of the swing bridge! His last voyage was in 1822 and following his retirement from whaling in 1823, he helped improve the harbour and provide work for the poor. William Scoresby Junior DD, FRS (1789 - 1857) was apprenticed to his father aged 13. At 17 he was promoted to chief mate and at 21 he replaced his father as captain of the Henrietta . From the age of 17 he went to Edinburgh University to study sciences, returning to Arctic whaling in early spring each year. While at sea William Junior studied the Arctic seas, their climate, currents and biology. In 1820 he published his Account of Arctic Regions, which remains a standard work on the Greenland Whale Fishery. In 1822 he mapped a large part of the east coast of Greenland, publishing his chart the following year. William Junior finished whaling in 1823 aged 33 to train for the ministry. Dr Scoresby made a lifelong study of magnetism in order to improve the accuracy of the ships compass. He experimented with various grades of steel to improve the reliability of the compass needle and carried out experiments to discover the effects of iron on compasses, which were growing less reliable as the amount of metal in ships increased. He also collaborated with JP Joule in early experiments of electro magnetism. In 1838 the Admiralty asked him to assist in the construction of compass needles, he agreed asking only to be recognised for any acheivement. Several years later the Admiralty began to use his specifications but despite a bitter row they would not acknowledge his invention. The Scoresby Chair is in St Mary's parish church, next to Whitby Abbey. It is handsomely carved in teak taken from the wreck of the "Royal Charter" a ship in which the Rev. W. Scoresby Jnr. had undertaken a scientific journey to improve the effectiveness of the compass. Whitby has always been closely associated with sea fishing. In 1540 John Leyland (the librarian of King Henry VIII) wote that Whitby was "a great fisher towne" and was particularly renowned for it's herring fishing. It went into decline for several centuries until the formation of the Whitby Herring Company in 1833 for the curing of herring to produce kippers. By 1888 Whitby had between 150 and 200 herring boats of its own however, the fishing fleets of Yarmouth, Penzance, Lowestoft and Scotland also brought herring to Whitby. At is peak as many as 800 lasts ( a volumetric measure which equates to about 4000 pounds in weight) were taken in a season. About half of this was sold to vessels from France and Belguim while upwards of 120 lasts were cured by the Herring Company and others in town. In line with the traditional agricultural harvest, August and September saw the herring boats gather in the Harbour at Whitby in such great numbers that, at times, you could walk from one side of the harbour to the other across their decks. Women - folk played their part in the fishing fleets success too. Fish wives, as they were affectionately called, were paid 1s6d (7.5p) a day for their onerous and oderous work of counting the fish on board the boats. Significant growth for the fishing industry came in the middle of the 19th century when the newly developed railways opened arterial routes out of Whitby, giving a lifeline both in and out of the precariously located town. Of course the perishable nature of the product meant that the railways were an ideal way of transporting the fresh fish, from the quayside market, inland. By the 1960's the herring stocks were depleted and the industry waned and disappeared.